The third-generation TT is a playground for adrenaline junkies, tech geeks, and design addicts alike. 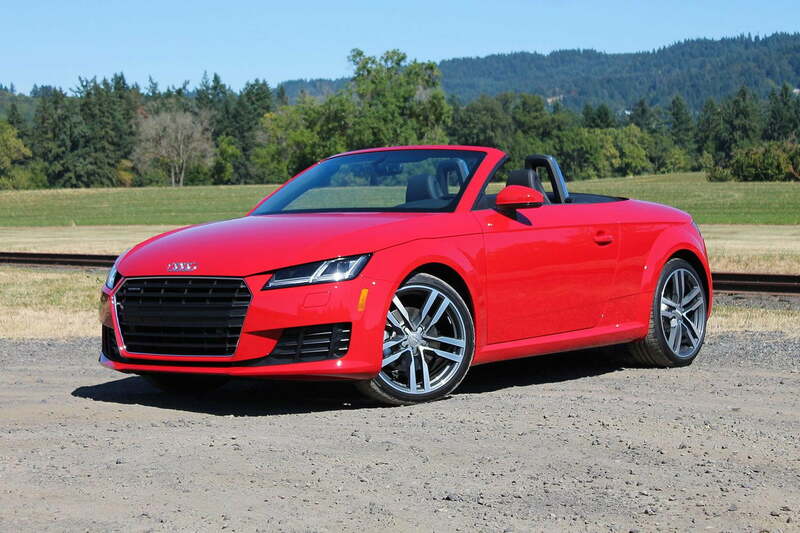 I once heard the Audi TT described as “Meg Ryan on four wheels.” That might be a dated reference for some of you, but early models of the long-running sports car fit the bill perfectly. Bubbly, charismatic balls of enthusiasm, the car was adorned with soft angles, rounded surfaces, and more circles than the Olympic logo. For 2016, the TT is sharper. Edgier. More aggressive. It’s the Angelina Jolie to 2003’s Ryan, a significant departure from the perky iterations of old. While the first TT was a design icon for its concept car styling, the new one is a driver’s car through and through. But that’s not to say it doesn’t boast major aesthetic chops. The innovative cabin, stunning Virtual Cockpit, and laser-sharp exterior are stunning from every vantage point, and the interior layout makes so much sense we wouldn’t change a thing. 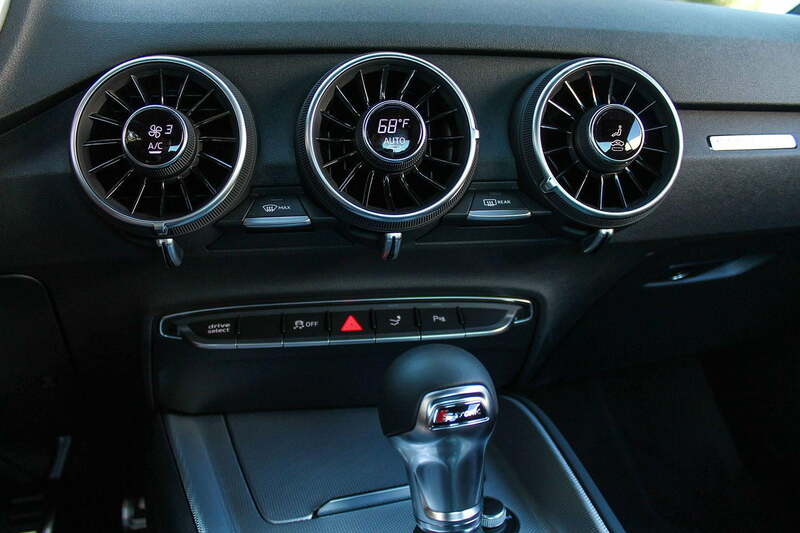 Step inside the TT and you’ll notice something missing — the center screen. The third-generation model doesn’t have one, not because it can’t have one, but because it simply doesn’t need one. 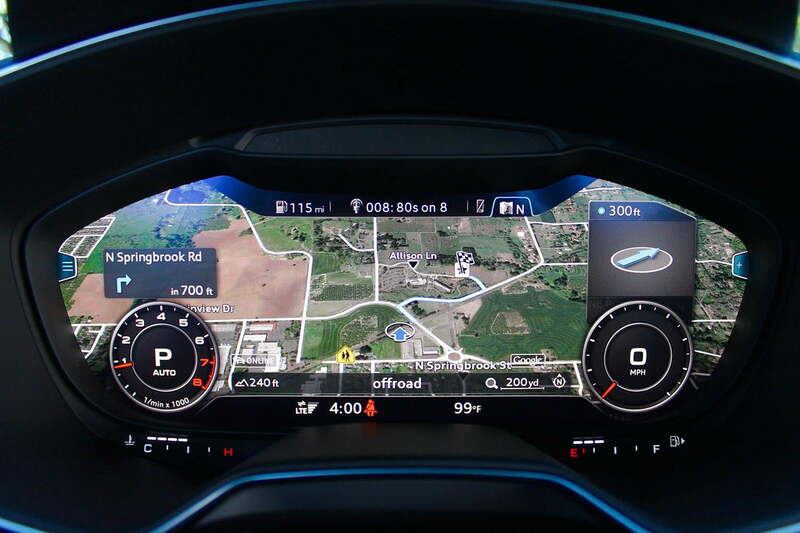 The reason for this is Audi’s Virtual Cockpit, a brilliant 3D display that routes everything from stereo control to Google Earth navigation to safety data onto a 1,440 x 540 digital readout in front of the driver. Everything is accessible via a series of switches on the steering wheel, which gives the interior a “pilot-centric” feel and a minimalist look. What’s more, it operates at a smooth 60 frames per second thanks to a Nvidia Tegra 3 processor, it’s brighter than an iPad (so the passenger can see everything clearly), and it’s standard on every TT. Give it a day to get used to, and you’ll wonder why nobody thought of this concept before. It’s awesome. For passengers looking for something to do, not to worry — every function can still be controlled through the Multi Media Interface scroll wheel on the center console. 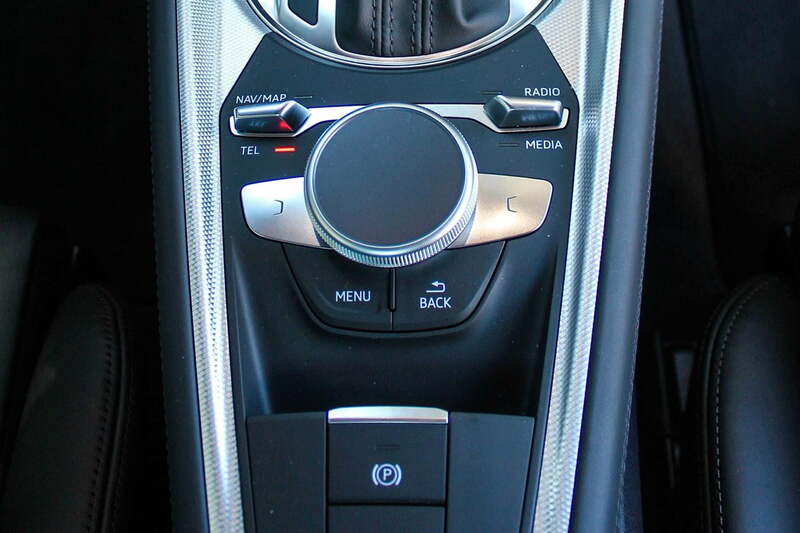 The swath of climate control switches that litters almost every vehicle has been consolidated to a single multifunction knob inside each air vent. The integrated design doesn’t just clean up your field of view, it looks amazing, especially with the dashboard’s aircraft-inspired topography. Occupants are also treated to two USB ports in the console, and it’s about dang time. This is the point where I’d typically mention the back seat space, but its paltry dimensions are only suitable for grocery bags, kids, and adults without heads. You’re probably wondering what the R stands for. After all, the TT RS isn’t coming until the 2017 model year, and the sportiest driving mode in the TT is labeled “Dynamic” instead of “Race” like in the VW Golf R. Well, for the TT’s third generation, Audi has categorized the TT as an “R” vehicle alongside the R8 and R18 race car. Bold statement? Without a doubt, but for 2016, the two-door is no longer just a sporty car; it’s an honest to goodness sports car. After carving my Tango Red Coupe through a series of country roads at the vehicle’s first drive event, I believe it. While the first TT was a design icon for its concept car styling, the new one is a driver’s car through and through. Exiting the first corner on a road called Bible Creek, I was immediately impressed by the quattro all-wheel drive system’s outstanding grip and control. I thought I’d miss the extra grunt of the 292-horsepower TTS version, but even the base TT is a blast at any speed. With 220 hp and 258 pound-feet of torque coming from its turbocharged 2.0-liter, the 3,186-pound Coupe manages 0 to 60 mph in 5.3 seconds and a top speed of 130 mph. In Normal and Comfort modes, the car is quiet, smooth, and refined over relatively bumpy surfaces. In Dynamic mode though, the suspension hunkers down, the steering becomes tighter and more focused, and the quattro technology sends a liberal helping of torque to the rear. The car feels incredibly planted, but it will subtly rotate its back end when coerced. Still, you get the feeling that the car’s limits are miles ahead of yours, resulting in a package that’s incredibly accessible and easy to drive. The same goes for the Roadster, which I was lucky enough to pilot through a short loop after my affair with the Coupe had ended. It felt exactly the same in terms of handling characteristics and driving dynamics — credit to the stability of the MQB platform — however it’s a tad slower to 60 mph (5.6 seconds) due to the increased weight (3,384 lbs). But having the wind in your hair and the sun in your face is more than worth it. The six-speed dual-clutch is wondrously responsive as well, but we admit we’d like a manual transmission option. Sadly, stick-shift sports cars are a dying breed. Fuel economy is rated at 23 mpg city, 30 mpg highway, and 26 mpg combined for either version. Why not buy the Golf R? This radar detector can keep you out of trouble if you’re enjoying the TT’s powertrain a bit too much. Automatic’s Smart Driving Assistant connects to the Web Dashboard, which uses comprehensive analytics to track fuel usage, route efficiency, and vehicle wear-and-tear over time. Whether it’s on the racetrack or a windy backroad, Cobra’s ‘Drive HD’ dash cam can record all of your escapades in 1080P/1296P. The question you see above was brought up more than a few times during the TT’s launch event, and it’s one with real merit. After all, the range-topping Golf is more powerful than the $42,900 base TT (It has the same powertrain as the spendier TTS), yet it’s $6,305 cheaper and is much more practical. For one, the available tech in the TT is miles ahead of what you get in the Golf (see: Cockpit, Virtual), but the performance driving feel is much improved. The TT is lighter, sharper, and more focused in the bends, and that’s in part due to its quattro AWD system. Taking 150 readings every 10 milliseconds to optimize power distribution, the TT can shuttle up to 100 percent of torque to the rear wheels under heavy throttle. The Golf’s 4Motion system effectively acts as front-wheel drive until you put your foot down, when it sends up to 50 percent of power rearward. There’s also the eye-catching styling and status that come with the Audi badge, both of which carry value in their own ways. What you’re really left with is two different cars with two completely different appeals and customer demographics. The Golf blends practicality and capability beautifully, and the TT is crafted for those looking for an entry into the sports car market that won’t leave you in a ditch. It drives different, it looks different, and most importantly, it feels different. I still look forward to getting behind the wheel of the hopped-up TTS soon, but as far as base models go, Audi has done a bang up job on the new TT. It’s pretty, it’s fun, it’s modern, and it has a ton of gadgets for the tech-savvy crowd. If you have the cash to spare and you’re looking for something that’s easy to drive fast and more comfy than an MX-5, this could very well be your next car.